Stole this from Kaylee. 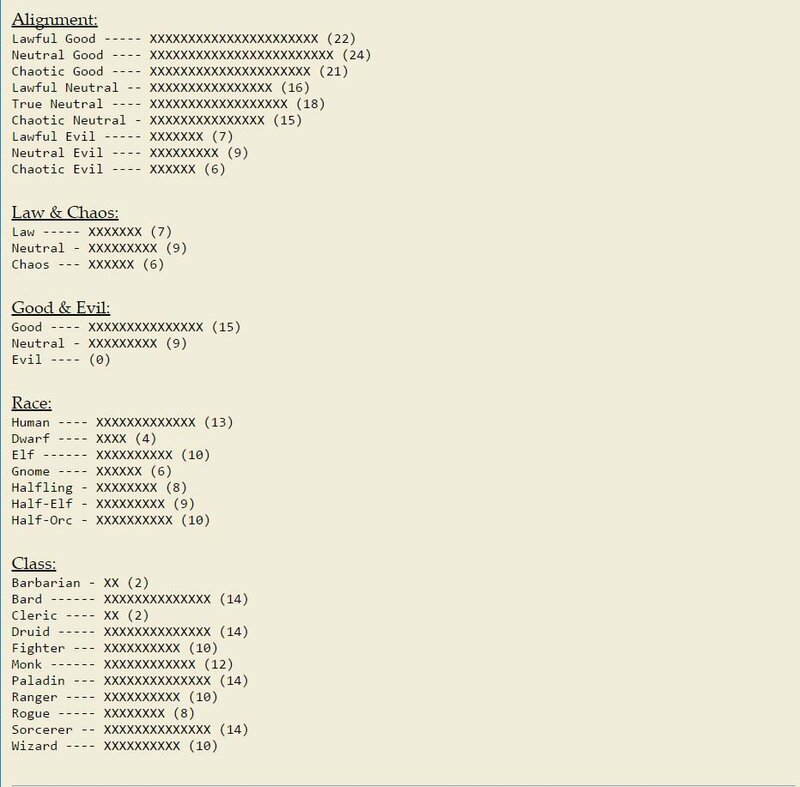 Pretty long quiz, 129 questions, but generates a character and stats. I mean, it's not as if I'm doing anything productive with my time. Guess I'll dive in. Whos gonna be our first chaotic neutral/ chaotic good Huber character? @Doctor-Professor Interesting that you're just a straight up sorcerer. @TokyoSlim Eh, it's just based on how many questions I answered "sorcerer-like," isn't it? Also, we got a lot of Humans in here. Where all the Elves at? 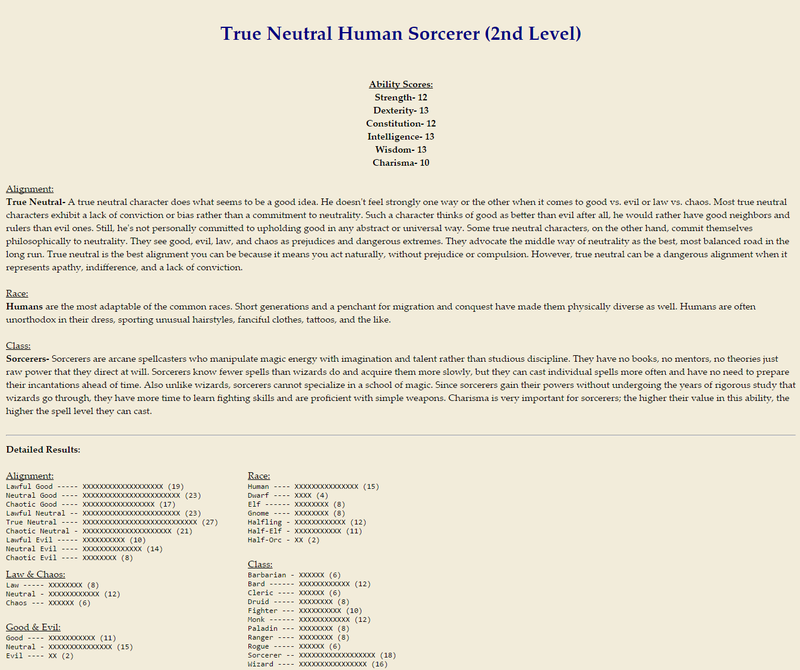 Managed to get it back, apparently I would be a very crappy sorcerer based on my stats, but I can see how I would make for a good halflingm just leisurely enjoying the good stuff in life. Halflings are clever, capable and resourceful survivors. They are notoriously curious and show a daring that many larger people can't match. They can be lured by wealth but tend to spend rather than hoard. They prefer practical clothing and would rather wear a comfortable shirt than jewelry. Halflings stand about 3 feet tall and commonly live to see 150. Monks- Monks are versatile warriors skilled at fighting without weapons or armor. Good-aligned monks serve as protectors of the people, while evil monks make ideal spies and assassins. Though they don't cast spells, monks channel a subtle energy, called ki. This energy allows them to perform amazing feats, such as healing themselves, catching arrows in flight, and dodging blows with lightning speed. Their mundane and ki-based abilities grow with experience, granting them more power over themselves and their environment. Monks suffer unique penalties to their abilities if they wear armor, as doing so violates their rigid oath. A monk wearing armor loses their Wisdom and level based armor class bonuses, their movement speed, and their additional unarmed attacks per round. You da man now dogg. I remember taking this a year or so back. I got pretty much the same result now as I did then. Also I remember all of my friends having higher ability scores than me, much like the majority of other people in this thread. Here comes all these bards with like 9 charisma.